OK!! Here it is!! LUSH by Timeless Treasures! These fourteen Tonga Batiks are chosen by Toni Steele and Jenny Foltz of Wing and a Prayer Designs. Those girls are so talented, and besides that, they live in Kansas!! Yea for that! Their patterns are so well written and easy to understand. We’ve never noticed any errors in them, which is a plus! You’ll love how they write and illustrate, it will make this so much easier to put this beauty together. 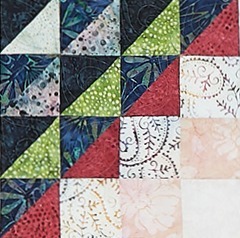 LUSH is available as a Block of the Month or as a Full Quilt Kit….the pattern is included in both options. 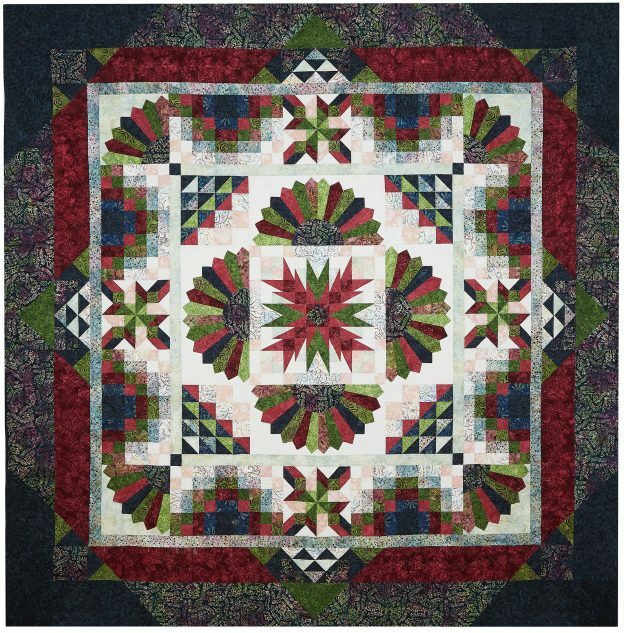 This Quilt is 108″ square, and features traditional blocks as well as “components”, which is why this doesn’t look like just any 12 block quilt! Block of the Month: This BOM runs for 10 months starting in August and includes the pattern and all fabrics for the quilt top AND binding. Backing is extra. Each month you will receive a fabric packet and the pattern for that chunk of the quilt. Usually it will include a block and maybe a “component”. Easy peasy! Cost is $20 to sign up (non refundable) and $27.99 per month, August through May 2019. Shipping is extra. Full Quilt Kit: This Quilt Kit is $279, and includes the full pattern and all the fabrics for the top and binding. Shipping is extra. 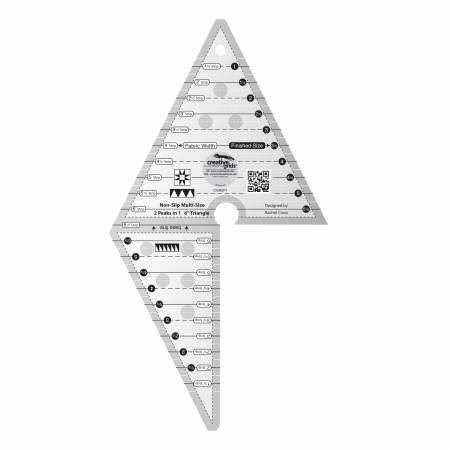 The Blooming Center Block points feature the Creative Grids 2 Peaks in 1 Ruler, or you can use the templates included in the pattern. Wing and a Prayer usually incorporate what they refer to as “components” into their quilts. 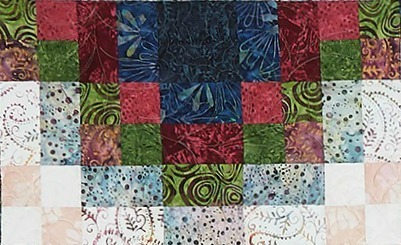 These are sections that are easy to make, but might not be what we think of as a traditional quilt block. Here’s an example: as you can see…easy to make! 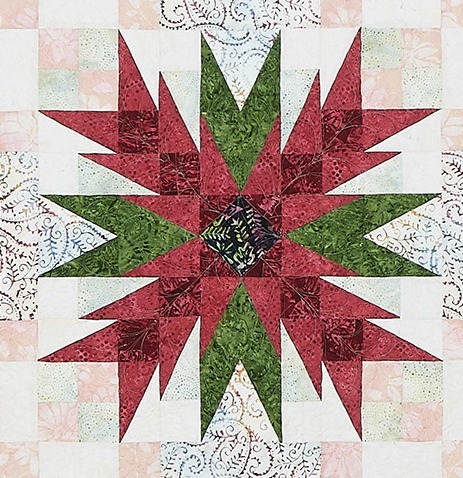 Eight of these are placed throughout the quilt, adding interest and symmetry. 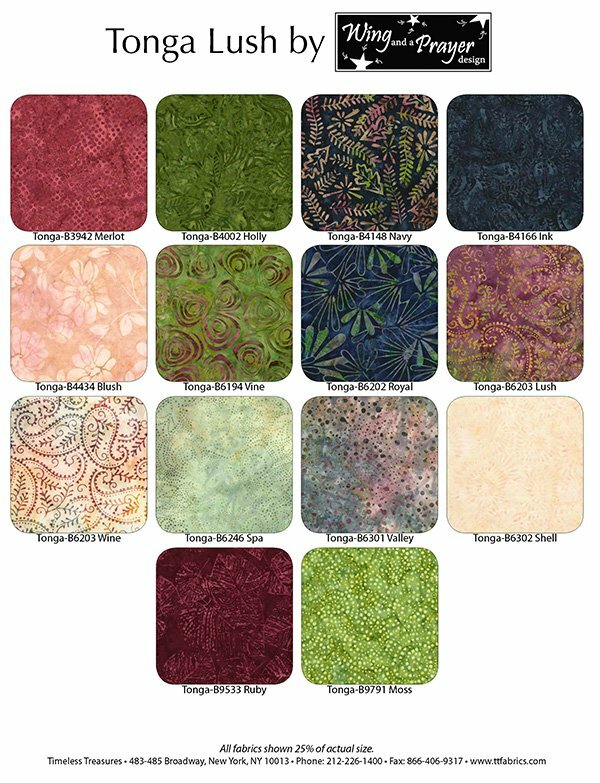 Here’s a picture of the gorgeous Tonga Batiks by Timeless, one of my favorite batik companies! Don’t you just love these colors, the way they wash into one another? And the great use of value, mixing the darks and lights to add contrast? These batiks will make a stunning quilt! I have the fabric in stock, but when it’s gone the next shipment is not until September, so jump NOW! !